I am obsessed with bagels. I mean generally speaking I’m obsessed with any bread related food item. But this year I’m in love with bagels. The thing with bagels though is they aren’t as easy to come by as one might think. I mean you can’t just walk into a bagel shop and get a bagel topped with vegan cream cheese. Well, unless you’re in New York. Store bought bagels just won’t do. This is my second attempt at bagel making. These bagels were made from the recipe in Vegan Brunch. My first round, from another recipe, while tasty, were over-baked and extra crunchy. This recipe yields a light bagel with a fluffy inside and a crunchy exterior. The vital wheat gluten helps give them a nice touch of elasticity which seemed to help when handling the dough. Overall they were easy to make and easier to eat. I gobbled up at least three. 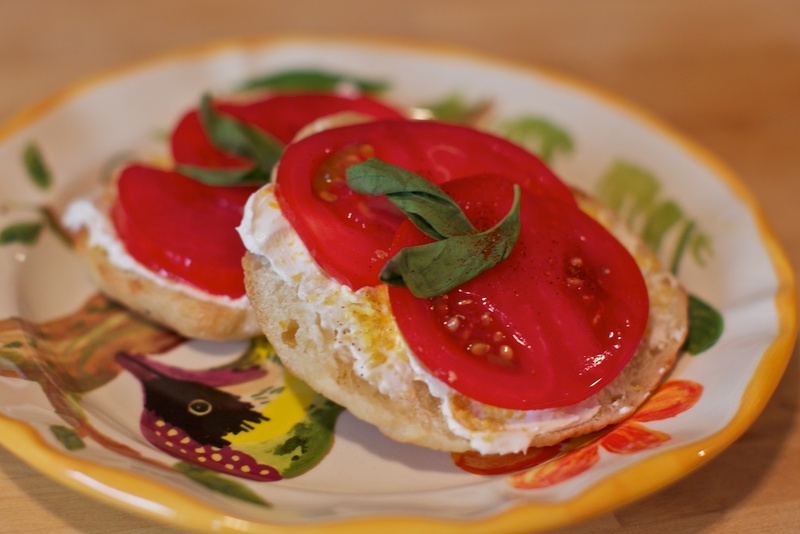 For breakfast I topped them with some tofutti cream cheese, a sprinkle of nutritional yeast, a fat juicy tomato from a friend’s garden, a touch of paprika and a few leaves of basil. Delicious! They also went extra well with hummus. I’m going to keep experimenting till I make some super fat round bagels; dense and chewy all at once. And perhaps some homemade cream cheese to go along with them. Oh the obsession continues. That bagel looks perfect! And the basil and tomato on top would be such a good topping. WOW now all I want to eat is a bagel! Your bagels DO look perfect!!! I have attemtpeted to make them once and they were “eh” , I really need to give it another go! oh man, that picture looks good. i have vegan brunch, and i’ve never even made a recipe from it. i think this post has inspired me to finally get cookin’. Bagels are a staple in our house, I also eyed the Vegan Brunch recipe, but had put it lower on my “to-try” list. Now you’ve convinced me to put it in the top three.